Never in a million years did I think I’d end up serving eggs and coffee to hundreds, thousands of people every year under the watchful eyes of a forest full of dead animals. I was happy in LA. Loved it! My family’s been there for ages, running a string of pancake houses scattered around the valley, and I was looking forward to raising my kids there. But you marry a guy and things change. Especially a Greek guy—they have ideas, you know? Tony came up to Montana on a guys-only fishing trip with some of guys he played baseball with when he was in the majors, oh so briefly, and came home raving. Saying we had to move, this town was a gem, the Jewel Inn a prize. A Swiss chalet in the Northern Rockies. Well, yeah, after we hosed it out with industrial-strength cleaners. Bought all new tables and chairs and spent I can’t tell you how many thousands on new kitchen equipment. Hired a taxi–what are they? Taxidermist to refurbish the dead heads. I’d have gladly thrown them out, but Tony wouldn’t hear of it—it’s authentic, he said. The Look. Give the customers what they want. HA. Well, don’t tell him I said so, although I have a hunch he’s figured it out. Tony was right. The town is a true treasure. The Inn is one of the first businesses you see when you drive into the Village, and summer mornings, we burst at the seams, serving omelets and crepes and pancakes and coffee from 6 am to 3 pm, with a few juicy burgers and sandwiches at lunchtime. And then—and this was my idea, thank you very much—when Drew Baker left the Lodge, we contracted with him to run dinner service. The best steaks, halibut and trout done beautifully, perfect pasta. Crisp salads, tasty appetizers, and dessert to die for. The kids are happy, doing well in school, and I’ve even got a few friends myself—especially those Murphy girls, Fresca and her daughters Chiara and Erin. And that antelope with the Groucho Marx nose and the Mardi Gras beads around his horns—antlers–whatever they’re called? He’s growing on me. Have you made a move you hadn’t planned on? How’d it go? Drop by Leslie's Facebook Author page --- everyone who "likes" the page and helps her reach 750 "likes" will be entered in a drawing for a box of notecards featuring paintings by the fabulous Montana artist Nancy Cawdrey! 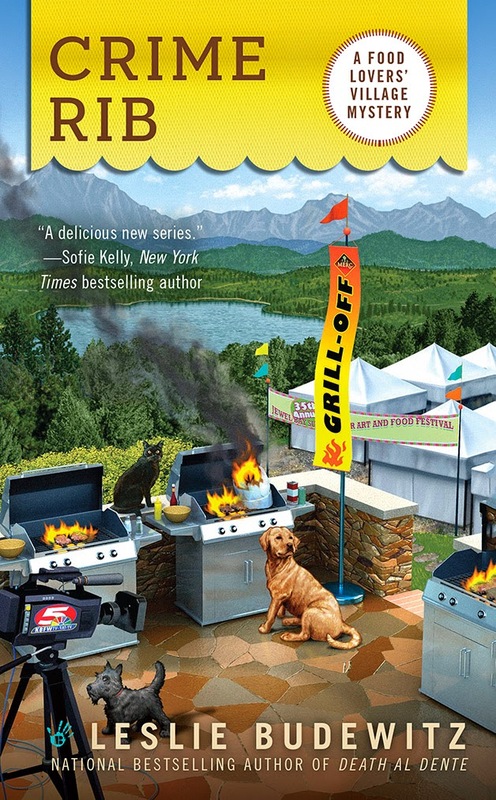 Death al Dente is the first in the Food Lovers' Village Mysteries by Leslie Budewitz (Berkley Prime Crime)—and nominated for the 2013 Agatha Award for Best First Novel. The series is set in a small, lakeside resort community in Northwest Montana, on the road to Glacier Park. Watch for Crime Rib, coming in July 2014 -- available for pre-order now! Sounds like fun. Good luck on this new book, Leslie.